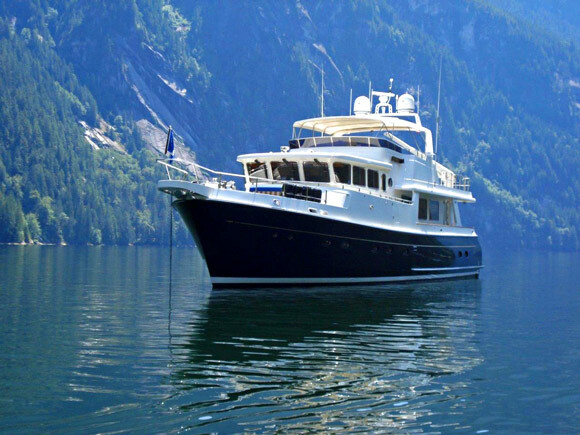 Among trawlers for sale, Selene yachts are always popular choices. Whether cruising across the bay or across the Pacific, Selene trawlers incorporate a fabulous combination of design features and philosophies. Selene trawlers will provide a safe, comfortable, and pleasant passage. Stoutly built, with an emphasis on sea-keeping capabilities as well as fuel efficiency, Selene trawlers are an ideal choice for yachtsmen and women with strict standards and high expectations. The strength and integrity of the hull is rivaled only by the fabulous appointments, premium systems and equipment, and stunning decor of the accommodations. State-of-the-art manufacturing processes permit Jet Tern Marine, (builder of Selene yachts) to offer Selene trawlers at prices that will never be considered “cheap”, but are clearly both reasonable and affordable when compared to any of the small number of competitors worthy of consideration in the same or similar class. Among yachts for sale, Selene trawlers are excellent values. Selene Trawlers are one of the most respected brands among production yachts and have established themselves as an industry leader through design innovation. Authorities often cite the 1950’s era conversion of some North Sea fishing boats, declared surplus by the British government, as the true beginning of the pleasure trawler genre. The same characteristics that made the full displacement deep sea fishing boat hulls suitable for one of the ocean’s most unforgiving occupations almost immediately attracted a specific breed of pleasure boater. The North Sea hulls were built to go to weather, tasked with a year ’round fishery in waters renowned for brutal winter weather. Fuel economy and range were primary considerations in the commercial fishery- savvy skippers wanted the flexibility to stay on the fishing grounds in search of a catch without being forced back to port to refuel. Pleasure boaters especially appreciated the stability of displacement hulls, smoothing out the ride underway and less prone to rock and roll when at anchor. Fuel economy, range, and seaworthy design aren’t typically associated with speedy performance. Yachtsmen attracted to the new trawler category were less interested in speed. They recognized that when seas get rough every type of power vessel slowed down to trawler speeds, but even then did not ride as comfortably. As the decades have passed, the pure cost of fuel and geo-political ramifications have increased the attention paid to fuel economy. Most significantly, the introduction of trawler style yachts fostered the advent of a new concept in yachting. For the first time in human history, the concept of a long distance voyage on a private pleasure boat included power vessels as well as sailboats. By the late 1960’s and early 70’s, some well-respected builders were mass producing trawler yachts, and some of those early trademarks have survived to the present day. The first Selene Trawler was launched in 1999. While some might assume that such a relatively recent entry into the business left Selene at a disadvantage, the opposite is actually true. The earliest pioneers in the trawler business had to learn from their own mistakes. If something was discovered to be disappointing or an idea developed for significant improvement, the economic realities associated with the cost of retooling and creating a new mold often forced early manufacturers to put desirable changes and upgrades on at least a temporary “hold”. Before Howard Chen founded Jet Tern Marine (parent company of Selene Yachts), he was well seasoned in marine design and yacht construction. Howard graduated from National Cheng Kuan University in Taiwan, with a degree in naval architecture. He put his training to practical use, spending 12 years managing various shipyards and manufacturing facilities in Taiwan. Howard Chen had the advantage of learning from mistakes already made, and corrected, by other builders. His hands-on experience in shipyard management provided insight into the most efficient and effective ways to produce a high quality product. Chen was well aware of the characteristics defining a high quality ocean trawler when he established Jet Tern Marine in 1998. Jet Tern Marine releases a new Selene Trawler hull at their ship yard. Chen was one of the first manufacturers to relocate from Taiwan to the Chinese mainland. He established his factory in Dongguan, China. 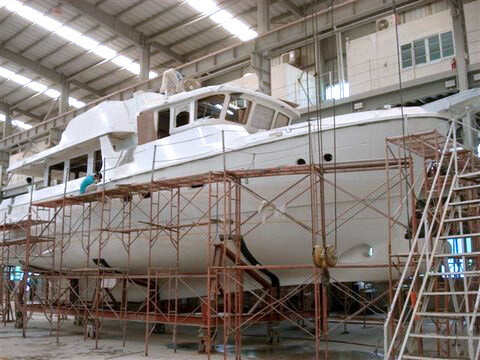 A new factory in Zhuhai allowed Chen to build Selene Trawlers in an extremely modern and efficient plant and to a very high standard. Selene Yachts were the first vessels built in China to achieve the ISO 9001 certification. ISO 9001 is only awarded to products where the quality is both extremely high as well as extremely consistent. Obviously, anyone purchasing a new yacht will be very interested in consistency- if the last 10 Selene Trawlers were produced to an exceptionally high standard, and the company has earned an award for consistent quality, there is good reason to expect the same degree of customer satisfaction from the 11th. Selene Trawlers are premium quality ocean going yachts ranging from 36 to 92 feet. 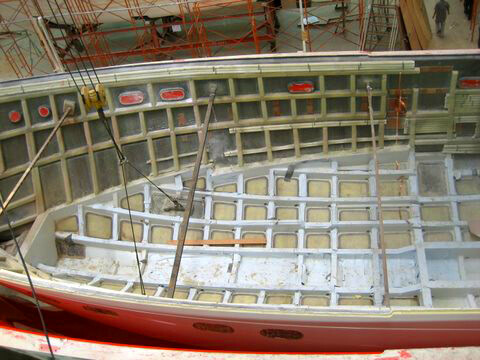 Selene Trawler’s robust internal hull structure.